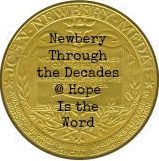 I read The Windy Hill by Cornelia Meigs for the Newbery Through the Decades challenge I’m hosting this year at Hope Is the Word. The Windy Hill was a 1922 Newbery honor book. It is the story of Oliver and Janet, a brother and sister who go to visit their cousin, Jasper Peyton, who lives a life of apparent leisure and ease as he oversees the farmlands surrounding his estate in Medford Valley. However, upon Oliver and Janet’s arrival, Oliver immediately recognizes that Cousin Jasper is a changed man–no longer “a man of quick, brilliant mind but of mild and silent manners” they had known ; instead, now he was “nervous, irritable, and impatient, in no sense a genial host.” As the story unfolds, we learn that Jasper is embroiled in a long and bitter family feud with his distant cousin, Anthony Crawford, who has returned to claim what is actually more than his portion of the family’s fortune. Interspersed throughout the story are seemingly unrelated tales told to Oliver (and later to Janet) by a neighbor whom Oliver chances to meet and whom Oliver calls the Beeman because the gentleman is a beekeeper of the first order. As the story unfolds, we begin to learn that the Beeman’s stories are more than just entertaining diversions; in fact, they somehow relate to the larger story. The story moves forward to a very exciting climax in the last few chapters in which all of the major characters in the story are involved in saving Medford Valley from a major flood that is largely due in part to Anthony Crawford’s pure cussedness. The denouement of the story is satisfying, if not perfectly happy. I am not familiar with this title at all. Thanks for reviewing it.